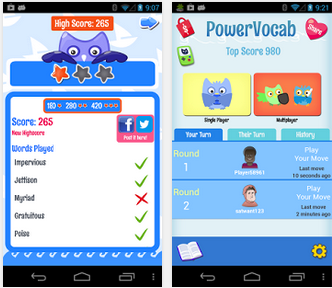 This is a powerful vocabulary game that helps learners builder their vocabulary. 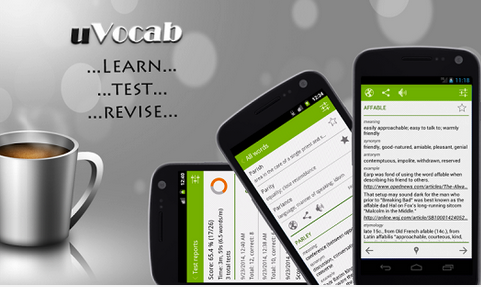 The app enables users to quiz themselves everyday to learn over 1200 words picked by expert tutors. Words include definitions and are illustrated in sentences. There are also different levels of difficulty (e.g. advanced, intermediate, and advanced). Learners can also track their progress as they study. 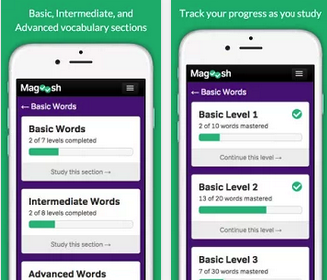 This mobile word game is a handy dictionary of challenging words. It also has a multiplayer mode where you play with other live user - have fun with social gaming for playing words with friends type of games! PowerVocab is specifically helpful for students of SAT, GRE, GMAT, and ASVAB, who are looking to substantially enhance their vocabulary into top tier. 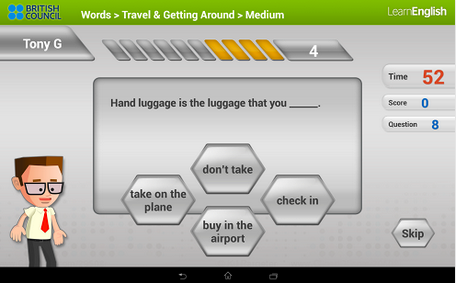 The key app features are Learn words, Challenge quiz, and Search words which is like a handy dictionary. The words contain detailed definitions, multiple example sentences, and phonetic pronunciation of words. Beat the clock and answer as many spelling, vocabulary and grammar questions as you can in this 60-second quiz! Johnny Grammar’s Word Challenge is a quiz for English learners to test common vocabulary, spelling and grammar that appears in everyday English.